You are here: Home / Being Human / Coloring Easter Eggs, Naturally! Although people have been coloring easter eggs for centuries, I have a feeling they didn’t always use pre-packaged dye tablets complete with stickers in whimsical easter designs. I’m always up for a crafty project, especially one that has a potential to get really messy! So this year, I decided to investigate how to color easter eggs the natural way, like great-grandma would have done it. I also like the idea of using fewer chemicals, especially if it’s a project to do with your kids. I tried to set my expectations that natural dyes wouldn’t be nearly as vibrant as the candy-colored ones the ‘egg coloring kits’ can produce. I bought a dozen eggs. Immediately I had a problem: eggs in the UK are all BROWN! In the US we could purchase brown or white eggs, so when coloring easter eggs, we always bought white. Hmmm. I could have splurged on expensive white duck eggs, but that seemed a bit excessive for this potential failure of a project. Plus, that’s against the British philosophy of “Make Due and Mend!”. So home I went with my brown eggs. 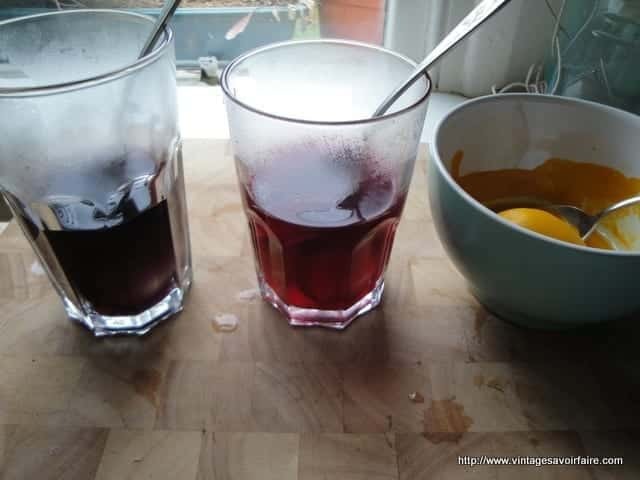 After a bit of research, I decided to try two traditional methods: making liquid vegetable dyes, and using onion skins. For the liquid vegetable dyes, I used beets (for a bright pink color), red cabbage (for purple/blue) and turmeric (yellow/orange). I made a really strong infusion of the vegetables/spices with water, added some vinegar (which is supposed to help the color be more vibrant and long lasting), and immersed some eggs in the liquid. Using onion skins is an old technique where you wrap eggs in onion skins, then hard boil them. When you remove the skins, there are pretty golden brownish designs all over the eggs. 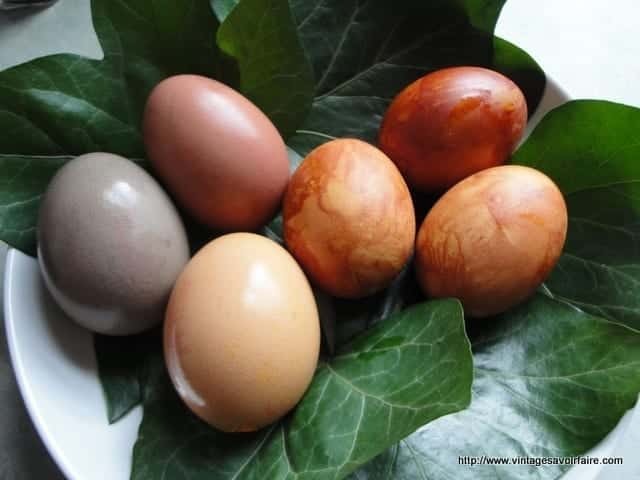 I would suggest using white eggs if they’re available – I think the colors would be much more vibrant! 1) Chop up the vegetables and put in a pan. Just cover all the vegetables with water (to make the dye as strong as possible). Add 1TB of vinegar. Bring to a simmer and simmer for 30 minutes. For the turmeric, I mixed 1 TB dried turmeric with enough water to make a paste, then added 1TB vinegar. No need to heat/boil the turmeric. 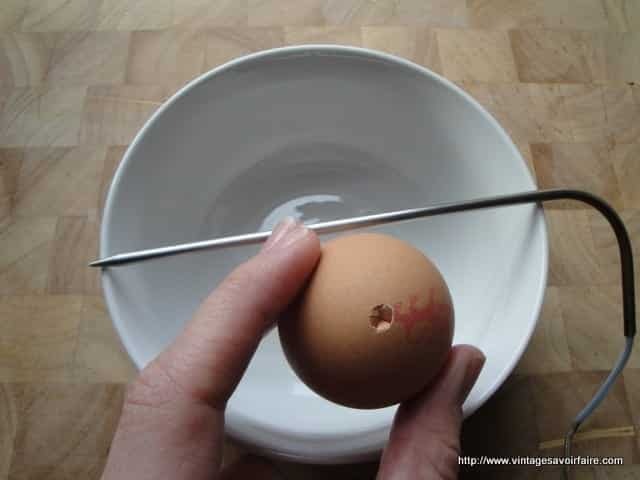 2) Meanwhile, decide whether to use hard-boiled or empty eggs. I like to empty mine out first by putting a hole in both sides and blowing out the contents (we used to LOVE doing this as kids! It makes lots of gross noises.). Then you have lots of eggs to use in baking/cooking. You could also use hard-boiled eggs. 3) Strain coloring liquid into a heat-proof glass. 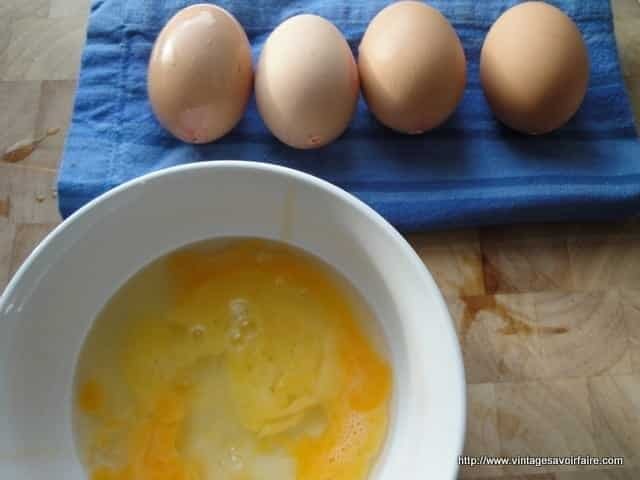 4) Submerge the eggs completely in the liquid (since my eggs were empty, I put a spoon on top of them to hold them down). Let soak for at least 30 minutes. For the turmeric eggs, just cover the egg in the turmeric paste, and let sit for 30 minutes. 5) Remove from liquid (rinse off turmeric, if using) and let air dry. Once dry, you may want to rub with some vegetable oil to make them shiny. I had tons of leftover egg dye, so I decided to tie-dye a kitchen towel! The results were … interesting. But again, it would be a great project to do with kids. Stay tuned for pictures! I really like the muted colors of your eggs; they look like alabaster. Great tip to rub them with oil so they are shiny. I love the pictures! They’re lovely – really makes you want to get going with Easter eggs. Very cool, I tried using an american egg colouring kit here once on the brown eggs, it was a tad disappointing but these are beautiful.